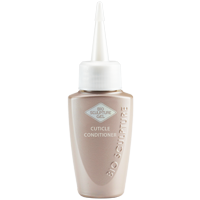 Bio Sculpture® Cuticle and Nail Conditioner is especially formulated with Tea Tree Extract, Lavender Extract and various active ingredients in bead form. Massage into nails and cuticles before preparation and/or after Soak Off. The heat and pressure of the massage will cause the beads to burst and release their moisture into the nail plate and prevent the cuticle and nail area from drying out and becoming brittle. Perfect for salon use, individual retail and as part of a Home After-Care Bag.